Let me introduce you to Mr. Turtle. Mr. Turtle was a female Syrian hamster, just like any other you might see in the pet shop, but this little hamster had a mission…or so it seemed to my family. First a little history. My wife Beverly had suffered a nervous breakdown; many bad things that had happened to her in her life before she met me all came flooding back to her. Nothing our son Hunter or I did could help her in this very dark time she had found herself in. Hunter was finding things difficult with his mother in the grips of depression so he began to go out. This was unusual for him because he didn’t mix very well, but he struck up a brief friendship with a boy on the next estate. Bevie was now in the deepest part of her depression. One day Hunter came in and asked if he could have a hamster, evidently his new friend’s family had purchased a snake and their hamster was now surplus to requirements. As he was asking me, I noticed Beverly smile and her eyes seemed to sparkle. I asked Bev if it was ok with her and she nodded and again a small but definite smile came to her lips. 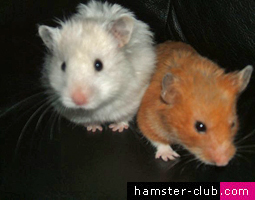 Enter into our family this quite ordinary-looking Syrian hamster. Hunter brought the cage into the house and placed it on his mother’s knee, and instantly that smile was there again. Having reared hamsters before, Beverly had no hesitation in putting her hand in the cage and lifting her new friend up to her face. This hamster was already two years old but she took to Bevie instantly and a bond was formed. It was like Bev had a new purpose, and it wasn’t long before they were inseparable. As soon as Mr. Turtle was let out of her cage she would make a beeline to Beverly’s chair, and climb up the back of the chair to sit on Beverly’s shoulder - unless of course Bev was eating - and then in a flash she was on Bevie’s plate sharing her food. As far as food went, Mr. Turtle’s cheeks were like suitcases, and if you left your bowl of popcorn unattended when you got back to it you would find a big hole in your stash and a very rotund Mr. Turtle in your bowl, ready to fill her stash. 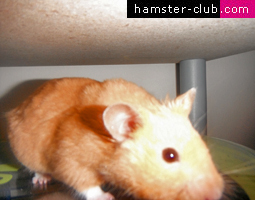 Bevie began showing signs of recovery and asked if she could have more hamsters, as she had dreamt of a place called Hamtopia…a place with lots and lots of happy, loved hamsters. Hunter was definitely in favor of this as Mr. Turtle was without doubt his mother’s hamster. Before long, Mr. Turtle had been joined by Stuart, Pippy, Smoke, Skye and Spartacus Falafel Cheesecake. Bevie was finding herself quite busy with her brood, and smiles had turned to laughter as she watched their antics. The bond between Bev and Mr. Turtle seemed unbreakable- everywhere Bev went Mr. Turtle would follow. When she was sitting in her chair, Mr. Turtle was on her shoulder. We have been having Mr. Turtle now for a year, which meant she was quite an old lady and she had fallen ill.
We took her to the vet’s and they said she had a growth in her belly and they would keep her in overnight, and if she was strong enough they would try and remove it in the morning. Morning came and with it a phone call from the vet, “Come and collect Mr. Turtle, the lump has vanished and she is eating her breakfast!” We were there in a flash and true enough, Mr. Turtle was bright-eyed and ready for home. Although she was very old for a hamster she stayed with us another two months, and on the day she left us she was running across the kitchen floor. Bevie took her eyes off her for a second or two, but when she glanced back Mr. Turtle was gone. She had just disappeared it seemed into thin air because all six of the hamsters had played in that kitchen and there were no escape routes. Although her leaving was devastating, she had been given those extra two months by some form of higher power. In my opinion that little hamster helped my wife when the doctors couldn’t, and since her arrival there has always been at least six hamsters here at Hamtopia, all of which are very special to us… but that original hamster who wandered into our hearts was very special indeed.